I use Terrasoul, Navitas Naturals and/or Oijo when it comes to cacao, maca, lucuma, mesquite and other superfoods. Whole Foods and Natural Grocers often times stock these products. You can also order them online via Amazon, Vitacost or directly through their websites. Blend the bananas, almond butter, cacao, lucuma, maca and mesquite – gradually adding water until you reach your desired consistency. Add in the cacao nibs and blend briefly to combine. 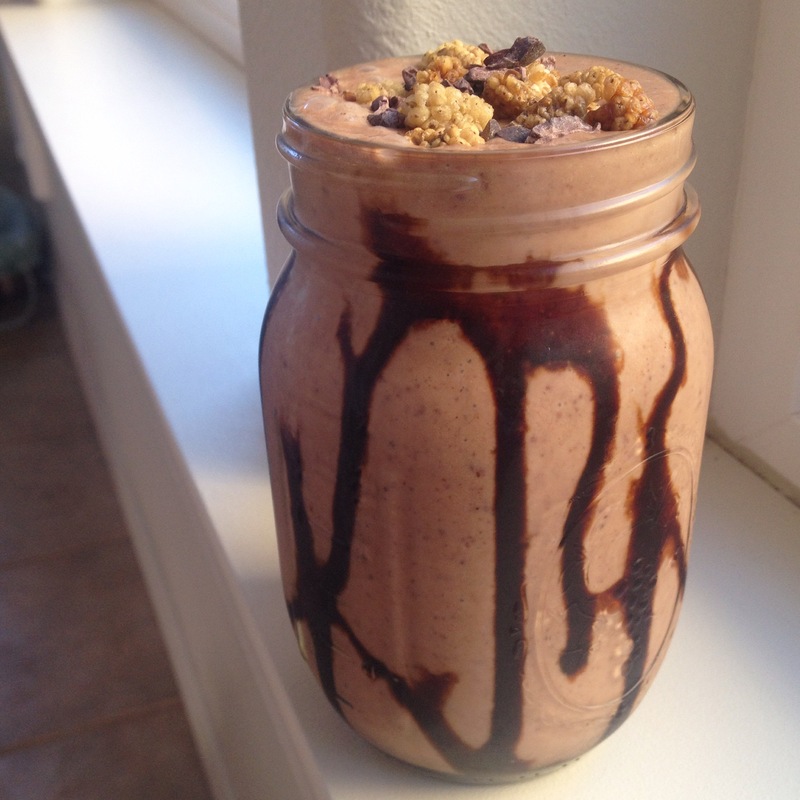 I drizzled my glass jar with a generous amount of blackstrap molasses, then poured in the thick chocolate smoothie. Toppings are optional, but I love adding them to my smoothies for crunch! Grab your straw and/or spoon and ENJOY! You can add dates, coconut sugar or maple syrup if it isn’t sweet enough, but I felt the lucuma, blackstrap molasses and bananas provided just the right amount of sweetness. Goodness gracious that is a gorgeous smoothie Mandy!! I LOVE the name too….might even make me eat bananas, haha! This sounds insanely delicious!!! Now I want one! !